View From The Porch: He is never going to live that one down. All the Terrorists in Cell Block D: "BWAHAHAHAHAHAHAHAHA!" Haider al-Bahadli: "No, guys, really! It was a good plan!" Haider al-Bahadli: "Hey, it wasn't my idea anyway!" Haider al-Bahadli: "Look, stop laughing! I didn't want to wear the wedding dress!" This guy is going to be eighty years old, running a convenience store in Flint, Michigan, and people will walk by and say "That's old Mr. al-Bahadli. 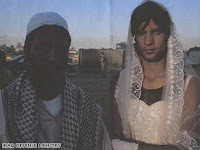 They busted him in Baghdad back in '07 and he was wearing a wedding dress." The other picture is cuter. "Klinger, take off that dress!" "So a pig and a goat dress as a bride walk into a bar..."
Jayne: "I married me a powerful ugly woman"
Mal: "You are not the man I met a year ago!" I think the United States should insist the marriage go forth. O tempe O mores. Had this guy been apprehended by his co-religionists, they'd have knocked a stone wall over on him. After a fair trial, of course. How far we have come from the RFC toast, "Gentlemen, I give you: our noble foe!" Look to me like the twain have done gone and met. By Jove, I think we've won! Don't they make a lovely couple? A standard dodge of the Elizabethan dramatist! Roberta, standard dodge? Hell, that's at least a Polara 500!